Lizzy Galliver in History on 18 July, 2015. Last Saturday marked the twentieth anniversary of the Srebrenica massacre, once again thrusting memory of 1995 into the Western media. It will soon be forgotten here, until next year. In Srebrenica, however, the memory lives on – and with it the devastating repercussions of the slaughter of thousands of Bosnian Muslims (Bosniaks) by (Orthodox Christian) Bosnian Serb forces during the Bosnian War. Today, political and economic instability governs Bosnia and Herzegovina, and the Balkan Peninsula is bruised by persistent fragility and cross-border hostility. One only needs to look to Saturday’s memorial service in order to recognise this, where the short-lived presence of the Serbian Prime Minister, Aleksandar Vučić, was met with jeers, stones thrown, and a very hasty departure. Evidently, Srebrenica has not forgotten. It has not forgotten the inhumane events of July 1995, a month that witnessed the culmination of years of post-communist civil war with the break-up of Yugoslavia into independent states, and the massacre of eight thousand Bosniak men and boys within a UN safe zone. These four days of coldblooded shooting were not simply a boiling-over of tensions, however, and they were definitely not an inevitable upshot of war. It was a case of ‘ethnic cleansing’ – motivated not only by the acquisition of land, but also by the forced removal of a populace – and the International Criminal Tribunal for former Yugoslavia has declared the events genocide. Serbia and the Republika Srpska disagree, and it is this absence of formal recognition that seems to fatally obstruct a clear pathway to reconciliation. One cannot help but draw comparisons between 1995 and the Armenian massacre of 1915 – both occurred within a context of war and internal strife, both held much-publicised anniversaries this year (with Armenia’s centennial commemorations in April), and both continue to perpetuate political instability in their corresponding countries. Perhaps most importantly, the incessant denial of genocide within the perpetrator states (Turkey and Serbia) halts progression towards peace even as efforts are made to foster it. While Vučić has been praised by many for gathering the ‘courage’ to attend Saturday’s anniversary ceremony in Potočari, just outside Srebrenica, he refuses to associate the word ‘genocide’ with the events of 1995. This official line has not only engendered a pervasive climate of genocide denial throughout Serbia, but also seems to validate a culture of abuse and alienation for those wishing to take responsibility for the stain on their nation’s legacy. In particular, the Serbian NGO Women in Black has attempted to confront Serbia’s past for the last twenty years, encouraging its population to follow suit. Sadly, its recent peaceful protests in Loznica, Valjevo and Belgrade were greeted by verbal and physical violence, and planned memorial services in the capital this weekend were banned by the interior ministry, due to a high danger of right-wing violent backlash. Clearly, popular sentiment and interpretations of 1995 are divisive both domestically and internationally. There remains a key difference between the massacres in Armenia and Srebrenica today, however; though the Armenian Genocide is certainly still a politically sensitive and emotive topic, Srebrenica is hardly even history. Saturday was both a memorial service and a funeral, with 136 newly identified Srebrenica victims being laid to rest. The youngest of these was only sixteen years old. Grief remains inescapable in Srebrenica, even today. Mass graves are still being dug up. DNA tests on bones are still in progress. Hundreds of families continue to wait for answers that may never come – as Hajra Catic, mother and wife to two victims of Srebrenica, agonisingly reflects, ‘I live for that call. Every year I think this is the year I will bury my son’. While EU foreign policy chief, Federica Mogherini, was not mistaken in his statement that the attack on Vučić went ‘against the spirit of this day of remembrance’, he (among many others) seems to forget that 2015 is not only a year of remembrance, but also one of painful discovery and the reopening of not-so-old wounds. Despite Vučić’s open condemnation of the Srebrenica massacre and vow to bring all those responsible ‘to justice’, his own slate is hardly clean. Though professing a drastically changed political posture, Vučić’s past is marked by membership in the Serbian Radical Party, working under Slobodan Milosevic’s dictatorial government, and controversy over media censorship. He is also well known for his past support of war criminals, particularly the celebration and protection of former Bosnian Serb army chief, Ratko Mladić, whose trial in The Hague is on-going. Although fourteen individuals have been convicted in a UN tribunal on account of their involvement in the massacre, the verdicts on Mladić and Radovan Karadžić (the other Serbian war leader judged most responsible for 1995) continue to hang in the air. On top of this, Russia has just vetoed a UN resolution to refer to the 1995 massacre as genocide – ‘an insult’, Amnesty International declares, ‘to the memory of the dead’. Srebrenica is very much a current political issue. Not only deemed the most atrocious act of inhumanity on European soil since World War II, the Srebrenica massacre stands out in history for another reason. It has left a conspicuous scar on the conscience of the UN, and in particular the Dutch nation, who continue to grapple with the humiliation and guilt of failing to prevent conflict in the very area they were tasked with protecting. The Dutch government resigned seven years later, following an incriminating report that revealed negligence in adequately supplying forces for the defence of both themselves and civilians from the Bosnian Serb forces. Since Srebrenica, the Netherlands seems to be taking a more active military and international peacekeeping role, with well-prepared troops sent to serve in Kosovo, Iraq and Afghanistan. Recent claims that the US, UK and France blocked vital air strikes against Bosnian Serb positions may implicate more of the Western world in Bosnia’s tragedy. Either way, anger continues to burn in the hearts of many Bosniaks today who blame their crushing annihilation on the Dutch battalion which seemed to abandon its post at the first glance of real danger. Twenty years on, and progress seems hesitant. 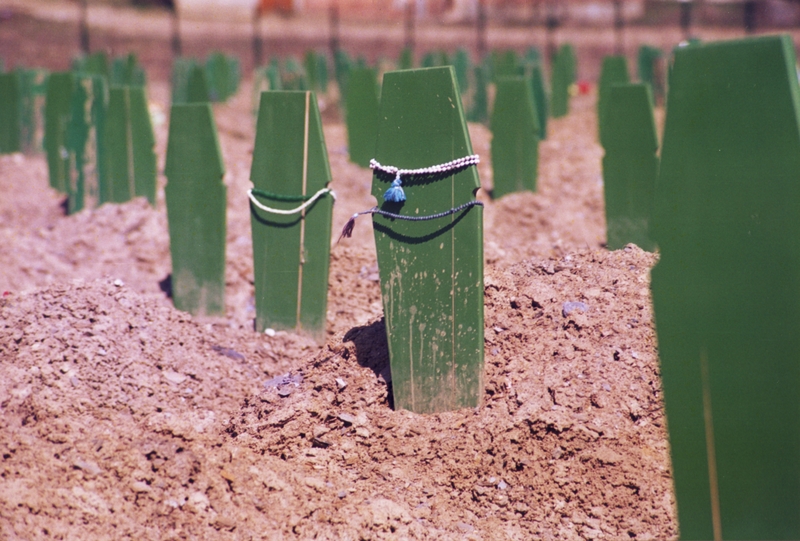 Commemoration is accompanied by the renewed pain of more burials each year, and many of those most responsible for Srebrencica are only now being held accountable for their crimes. Civil war may be over, but relations within and between Bosnia and Herzegovina and Serbia are visibly strained. Importantly, the media is not aiding attempts at collective healing, with recent headlines focussing almost entirely on the Serbian Prime Minister’s rebuffed hand of reconciliation instead of remembering the victims of 1995. Unclouded memory, palpable anger, genocide denial and media portrayal therefore seem to be inhibiting progressive memorialisation and even an attempt at historicisation. The legacy of Srenbrenica, unsurprisingly, lives on. Reconciliation is necessary, of course, but unobtainable until true recognition has taken place.